Although I might be making mistakes because I do not have all the paintings to review and the paintings do not all have dates, it seems that around 2007 Bradley stopped doing his story pictures, including the still lives, and returned to landscapes. 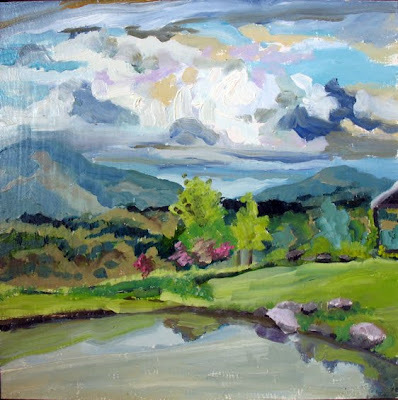 He took the subjective understanding he had acquired from his story pictures and his more developed color sense and used it on the Vermont landscape. 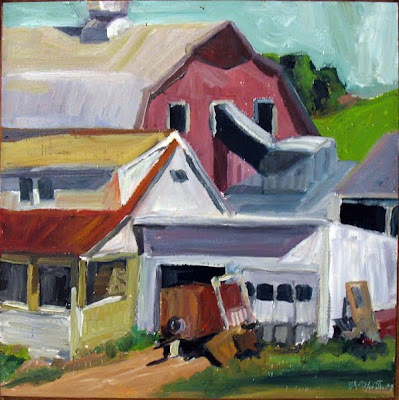 He did a series of large paintings of Johnson - his town - which seems to indicate an integration, that he is no longer the outsider, except that none of the paintings contain people. 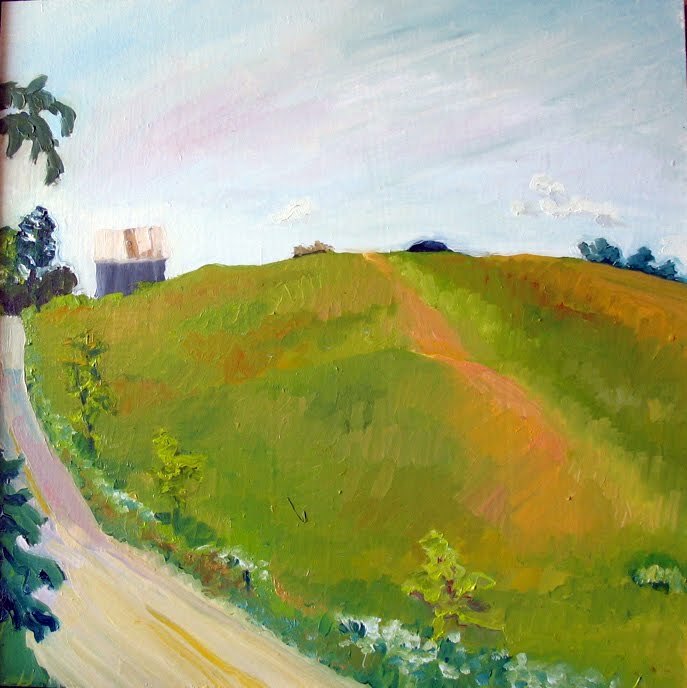 Every week during good weather he would send out an e mail informing the members of the painters group he organized, the East Johnson Plein Air Club, of directions to where and when the Sunday site would be. Much like Pissarro he enjoyed working alongside other painters and seemed to be (selectively of course) chronicling his environment. The Vermont landscape is difficult subject matter because our landscape is as pretty as a calendar and artists produce quite stereotyped works as a result. This painting feels like a release, there is nothing cribbed about it. Bradley did find a corner of Vermont that many others ignore as seen in this trailer on a hill -- the abode of the ordinary, the hardscrabble in a unmanicured field. My paintings are telling stories, Stories about people I have met, wanted to meet, places they have left their mark, and sometimes about people we all want to avoid. The Tales are about relationships with each other, with their environments, with people from our pasts, with our culture, and with relationships we hope to have. 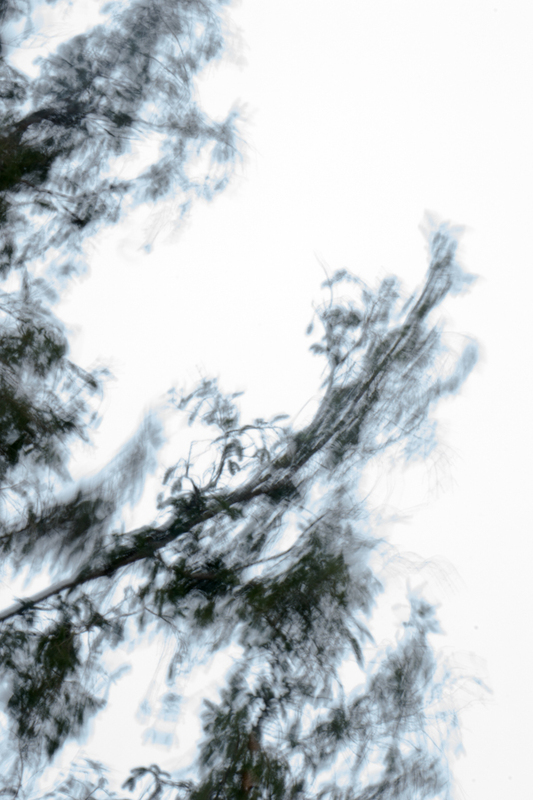 In telling the tales of others and their surroundings, I explore and tell the story of myself. 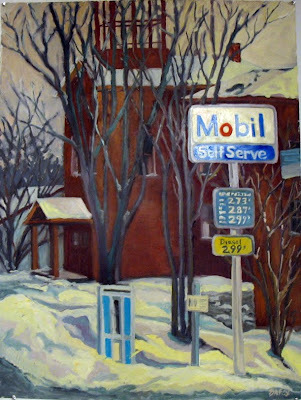 I create the narrative in my paintings with objects that people leave laying around in their lives. Toys, books, kitsch, trash in the environment, familiar places, and the general baggage of life are all subjects for these stories. Each object or place I choose to depict has a sense of history and time that helps define the person that owns it. It is the relationship that is revealed by the objects’ interactions that I explore in my narratives and paintings. A NOTE FROM SAM THURSTON: If anyone sees mistakes in this article please tell me by emailing me at mkramer@sover.net. If anyone could take photos of paintings they have of Bradley’s, that would be appreciated. Photos of paintings are usually best done with even natural light, no flash, just try to make the image square. Messy backgrounds are ok because the photo can be cropped. send photos to raloon.bialek@gmail.com (because I have dial up). NOTE: Works by Bradley Fox are still on view in Johnson at the Vermont Studio Center's Gallery II (across the street from the Red Mill Gallery), through the end of November. There are also some of Fox's pieces indefinitely at Ebeneezer's Bookshop on Main Street. -- Ed.